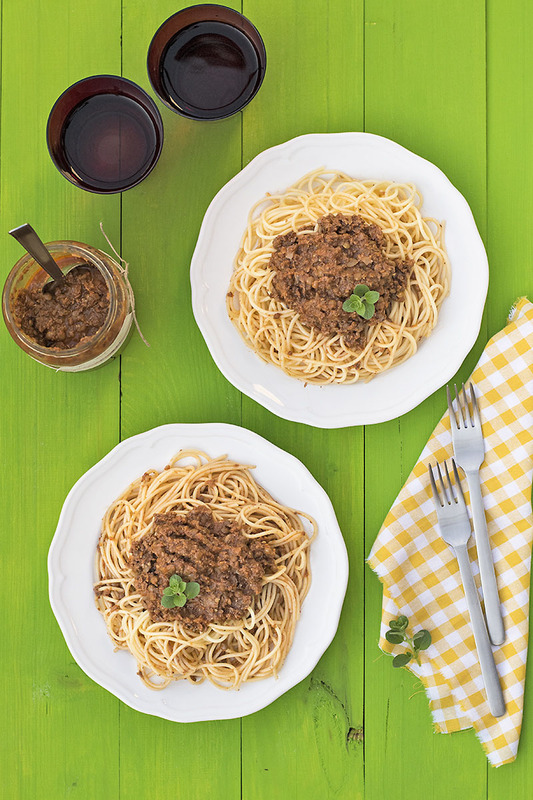 This vegan Bolognese sauce is soy-free and rich in protein with a taste very similar to the real thing! Perfect for a meatless dinner! 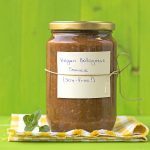 This soy-free and protein-rich vegan Bolognese sauce is the closest thing to a real Bolognese I have ever tasted! It has a deep “meaty” taste, a warm spicy aroma and enough texture to satisfy your carnivorous instincts. Until a while ago, when I wanted a meatless pasta dinner I often made a Bolognese sauce with soy mince in place of ground beef. I decided to experiment with this soy-less version because I read some articles claiming that while fermented soy products (like tofu or soy sauce) are good for us, we can’t really tell the same about un-fermented soy. 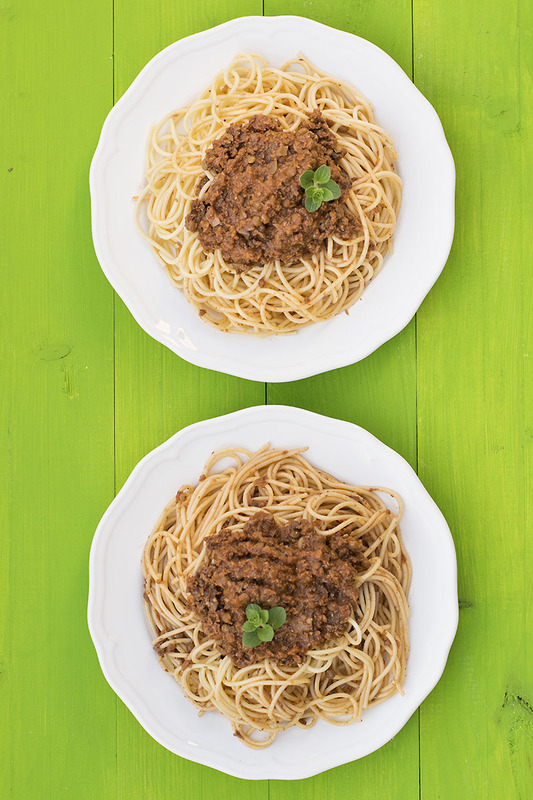 Now, I don’t know if this is true or not, so I urge you to do a little searching if you want to get to the bottom of this, but whatever the case, a delicious soy-free Bolognese sauce never hurt anyone 🙂 Oh, and if you like to check the traditional recipe, my mom’s spaghetti Bolognese will not disappoint you! Some time long ago I escorted my mother for a visit to my aunt’s house. Of course, I don’t remember much from that visit, but what I do remember is that when we entered her home we could tell that something really good was being cooked, probably some kind of meat. When I asked her what she was cooking, she told me she was baking some eggplants with potatoes (just think of it like a very simple ratatouille). From this (very short) story there are a few conclusions we can make. Firstly, most Cretan women cook really well and can create very tasty dishes with just a handful of simple – but fresh and seasonal – ingredients. Secondly, this is another example of how the Mediterranean diet includes many hearty, plant-based, meatless, and healthy recipes (such as this yellow split pea puree with sautéed mushrooms or this potato mash with red beans, soft boiled egg and mustard greens). Thirdly, this is hard evidence ( 🙂 ) that eggplant, when cooked the right way, can taste like meat. OK, I said “taste like” and not “taste as” meat. I mean, you can’t expect a vegetable to taste like meat, can you? Of course not. But with the right preparation and the right ingredient combination, you can expect it to resemble like meat. For this recipe, I’ve used a combination of ingredients, all with a “meaty” flavor like mushrooms, eggplant, and walnuts. To get the best out of the mushrooms and the eggplant you must cook them with some olive oil until they water out completely, and after all the liquid has evaporated you need to cook them some more until well browned. You’ll know when to stop because you’ll smell it. The carrot and raisins add some layers of sweetness, the spices, thyme, and tahini provide earthiness and warmth, and the tomato is the base that helps all the flavors to shine. In addition, walnuts and lentils make this sauce rich in protein and very filling! Sauté the mushrooms and eggplant very well! This recipe is perfect for canning or freezing. Just make a large batch, divide it inyo portions, freeze/can, and have it ready for times in need! Substitute savory or oregano for thyme. Portobellos, oyster mushrooms (pleurotous) or fresh porcini are ideal for this recipe, but other types work well too. Roughly chop the mushrooms, carrot and eggplant and transfer them in batches in a food processor. Process until finely chopped but not mushy. You can also finely chop them by hand or grate them through the coarse side of a grater. Heat a large pot over high heat, add the olive oil and the chopped vegetables and cook until all the juices evaporate, stirring frequently. Then cook some more, stirring constantly, until well browned, caramelized and fragrant. Add the onion, cinnamon stick, bay leaves, cumin, salt and pepper and cook for 1 minute. Add the garlic and cook for another one minute. Add the wine, pureed tomatoes, raisins (or plums) and tahini, let it come to a boil, reduce heat and let it simmer until reduced and thickened, about 20 minutes. Add the walnuts and lentils and cook for 20 more minutes (add a splash of water during cooking, if needed). For one full cup of cooked lentils, you'll need about half a cup dried lentils. Boil them while preparing the vegetables to save time. For serving, I like to mix some sauce with the pasta, and then top with some extra. Hey Makos…! 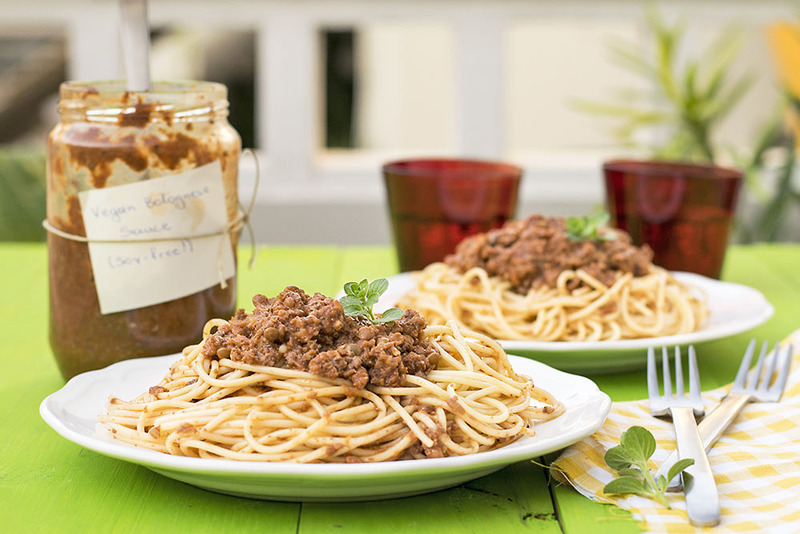 this look amazing and this perfect sauce for pasta, i will trying to making this sauce. am sure my family will like it. Thanks for sharing……! Thanks! I hope you’ll enjoy it! 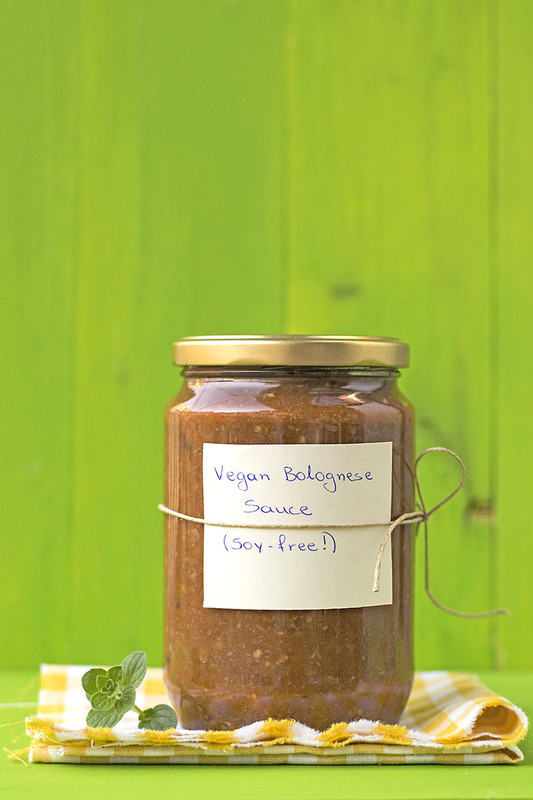 The vegan bolongnese sauce sounds interesting, I can’t wait to try it.. Thanks for this awesome recipe! It’s guilt-free satisfaction! Thanks Akhilla!!! 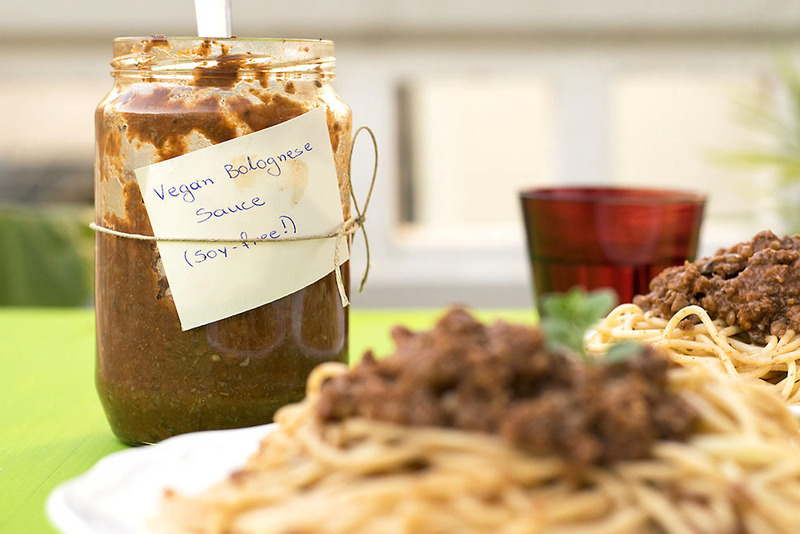 I’m a big fan of Bolognese sauce, can’t wait to try the vegan version! I really LOVE this recipe. I recently made it and not one part of me was missing the meat. It is hard to pull this off with Bolognese (high expectations) but you did it amazingly. Thank you!! I was thinking the same thing when I first tried this recipe!! !